Refinancing can consolidate student loans and make it easier to pay off your debt faster to save money. The advantages of refinancing student loans can be tremendous. But, there’s a catch. You can’t refinance federal student loans through any federal relief program. So, when you refinance, you must convert all your federal student loan debt to private. Here’s everything you need to know to make an informed decision about student loan refinancing. Should you refinance student loans? Debt.com can help you decide. In some cases, you can actually do both. You get out of debt faster even though you pay less each month. That’s because reducing interest charges allows you to pay off student debt efficiently. When you refinance, you actually take out a new loan at a lower interest rate. Then you use the money from the new loan to pay off the original loan (or loans) that you want to refinance. Debt consolidation is basically refinancing multiple loans with one new loan. So, when you refinance student loans, you often consolidate your student debt as well. First, you determine how much debt you need to refinance. Make sure to note the current balance and APR on each loan you want to include. Then, you shop around for a loan that fits your needs by getting quotes from lenders. Once you find a loan with a rate and term to fit your needs, you apply for the loan. You authorize the lender to run a credit check, which creates a hard inquiry on your credit report. The lender will also ask for information about the existing debts you wish to refinance. Whether your credit score is high enough to qualify; every lender has a minimum credit score required to qualify for their loans. If your debt-to-income ratio is below the lender’s maximum allowable DTI ratio with the new loan payments factored in. Once approved, you work with the loan underwriter to find a term that offers the monthly payments you need. A short term means higher monthly payments, but lower total interest charges. A longer term means lower monthly payments, but a higher total cost. Then once you finalize the loan, the money gets disbursed to pay off your existing loans. This leaves only the new loan to pay off. As you shop around for loans, make sure to only ask for quotes! If you apply for multiple loans, you authorize multiple credit checks, which creates lots of hard inquiries within a short span of time. Too many hard inquiries can actually hurt your credit score, making it harder to qualify for the loan you want. Lenders may have special restrictions on refinancing student loans. Some lenders will only allow you to refinance if you graduated and earned a degree. Lenders may also have restrictions what types of student loans they refinance. For instance, some lenders don’t refinance parent PLUS loans. Most lenders have maximum loan amounts you can refinance. Others only offer loan terms up to a certain number of years. Credit score requirements can vary widely by lender and qualifying for student loan refinancing is usually more relaxed. In other words, you may have a credit score that wouldn’t qualify you for a mortgage, but you can still qualify for student loan refi. Even if you have bad credit, there are online lenders that will work with you. Debt-to-income (DTI) ratio limits also vary slightly by lender. Lenders calculate DTI with your new payments factored in and your old payments taken out. Most lenders won’t lend to you if your projected DTI is above 45%; some lenders require even lower DTI. The easiest way to shop around for loans is usually to use a loan comparison tool. This allows you to get quotes from multiple lenders at once. Additionally, these tools help you narrow your list down quickly by eliminating loans you can’t qualify for in your situation. Try to avoid loans with fees. This includes loan origination fees, as well as early repayment or prepayment penalty fees. At Debt.com, it’s our mission to connect you with the best debt relief services in the industry, so you can get the help you need without a hassle. For student loan refinancing, we recommend Credible because it streamlines the whole process of refinancing. First, you tell Credible what you’re trying to accomplish with refinancing, besides just getting a lower interest rate. This way, the tool only shows you loans that fit your goals. You also tell them where you went to school and what degree you earned. This narrows down the list further by eliminating loans where you don’t meet the qualification requirements. Once you give them some personal information, like your name and phone number, they show you loans that meet your needs. Once you find a loan that fits your needs, you choose that lender. Then Credible has an automated tool that easily imports information about your existing loans. You fill out a few more details and then the lender has everything they need to get you approved. They can help you find loans regardless of your situation – even if you didn’t graduate and earn a degree. Their lenders work with all types of loans, including Parent PLUS loans, which many lenders won’t refinance. Parent PLUS loans also don’t qualify for federal loan relief. You get quotes from up to 11 lenders instantly. Deciding to refinance is a big decision. For some, it’s an easy choice. If most of your student debt is already private and you have good credit, it makes all the sense in the world to refinance. But if most of your loans are federal and your credit is less-than-perfect, then the choice is less clear. The problem with refinancing student debt is that you can’t use a federal relief program to refinance your federal loans. You must go through a private lender to refinance. Why aren’t there federal programs to refinance student loans? There are two types of student loans you can take out to finance your education: private and federal. Federal loans are the ones that you applied for through FAFSA. They come from specific loan servicers, like Navient. These loans are back by the federal government, which means the lender has extra protection in case you default. Since federal student loan applications through FAFSA are based on need, your credit score is not a factor to qualify for your loans. That also means that the interest rates on student loans aren’t set based on credit score either. Instead, rates are set every year based on the 10-year Treasury note index. That’s basically a fancy way of saying that the government decides the rate. When you use federal relief programs to consolidate or find easier ways to repay your debt, credit score still isn’t a factor. All federal repayment plans calculate interest by taking a weighted average of the rates on your existing loans. As a result, there’s no real way to refinance student loan debt through the federal lending system. Instead, you must go to a private lender. Private lenders give you a rate that’s based on your credit score. This allows you to reduce the interest rate applied to your debt, which is the primary goal of refinancing. If most of your student loans are fed loans, you have a choice to make. The decision depends heavily on your financial situation. If you have a good job with a steady income and a balanced budget, then refinancing is often the right choice. You’ll save money and eliminate your debts faster, so you don’t have to worry about paying off student loans for years to come. All federal loans have a term of 10 years – federal repayment plans have terms up to 30 years. That’s a long time to be paying off the same debt. So, if refinancing can help you pay off your debt sooner, then it makes sense. But that’s only true if you’re fairly confident in your ability to maintain financial stability. That last one is a big deal if you are a public servant, such as a nurse or teacher. Student loan forgiveness can get you out of debt for a lot less. In some cases, you may only pay back a portion of what you originally borrowed, without incurring penalties for settlement. Use Debt.com’s refi-ready self-assessment test to decide! Debt.com makes it easy to decide if you should refinance with a simple 3-question assessment refinancing assessment test. Answer the three questions below. If you answer “yes” to all three, then refinancing is probably the right choice for you. If you answer no to any question, we’ll also tell you how to decide if refinancing is still the best choice. Are most of your student loans private? If most of your student loans are private, you are a good candidate to refinance. If most of your student loans are federal loans, then deciding to refinance will come down to the next two questions. Refinance if you said yes. A better score means there’s a good chance that refinancing will get you a lower interest rate. Private lenders will assign you a rate based on your score. However, for student loans, you can often still get a better rate even with bad credit because lending standards are more relaxed. But if you have excellent credit then it’s an easy choice to go ahead and refinance. Are you financially stable enough to be confident that you won’t need federal relief programs for any federal student loans you hold? If there’s any chance that you may experience financial hardship, refinancing may be risky. You won’t have access to federal programs that can significantly reduce or suspend your monthly payments altogether. In addition, if you are a public servant, refinancing means you also lose eligibility for federal student loan forgiveness. If refinancing student loans is the right choice for you, use Credible to compare loans from up to 11 lenders in the next 10 minutes. Keep in mind that certain lenders may have specialized eligibility requirements for refinancing student loans. This table provides a list of requirements that generally apply to all lenders, as well as requirements you see from some lenders. You must be a U.S. citizen OR permanent resident of the U.S. to refinance on your own. If you are a resident alien, then you must have a cosigner who is a citizen or permanent resident. Your loans must be in repayment – i.e. you can’t refinance while you’re still attending school. Some lenders require a minimum amount of debt, usually $10,000 or more. Other lenders (not all) require you to earn a degree to refinance with them; they will require proof you graduated. In some cases, they may waive this requirement if you’ve been making payments on time for a certain amount of time. Not all lenders will work with all types of student loans. Some lenders will not refinance Parent PLUS loans or loans from certain federal or state student loan programs. Some lenders also won’t take loans that are already enrolled in a hardship-based repayment plan, such as Pay as You Earn. Are there any advantages to private student loan refinancing for public servants? Federal relief programs can be beneficial, but they also come with a lot of hoops to jump through. Enrolling in a hardship based repayment plan requires certification of your income and family size. You must recertify every year. At the same time, you must certify you work in a qualified public service profession. You should reapply for that certification annually AND anytime you change jobs. It’s a lot of work to get the remaining balances on your loans forgiven, and it’s not guaranteed that it will work. The Department of Education can change their standards for what jobs qualify for forgiveness. The Trump Administration has already placed additional limits on certification. As a result, people who thought they would qualify for forgiveness don’t under the new rules. Private student loan refinancing is straightforward and simple by comparison. So, you may decide it’s easier to go the private route to save yourself the hassle. What’s more, qualifying for federal student loan forgiveness requires you to make payments on a hardship-based repayment plan for 10 years before your remaining balances get forgiven. So, you won’t get out of debt quickly if you want to use Public Service Loan Forgiveness (PSLF). This means that if you want to get out of debt fast, you may be better off with private student loan refinancing. Yes. If you improve your credit profile after you consolidate, you can refinance to get a lower interest rate. This logic specifically applies when you consolidate through a private lender. You’ll get an interest rate that’s at least partially based on your credit score when you consolidate the debt. Then if your score improves, you can refinance to lower the rate even more. You can also choose to refinance student loan after consolidation if you used a federal consolidation loan. You may decide that the interest rate reduction and cost savings are worth the risk of losing eligibility for federal relief. As long as you can keep up with the payments, going for a lower interest rate is usually the best option. We recommend watching your mail. Lenders look at credit reports to screen for pre-approved offers. If they see you have student loans and can give you a better rate, they’ll definitely try to contact you. There’s nothing wrong with at least talking to them to get a quote. If it sounds like it’s worth your time, you can proceed with the loan application to refinance. Can you refinance student loans with bad credit? Yes. The good news is that lending requirements for student loans are nowhere near as strict as other types of loans. There are several online lenders that specialize in helping borrowers with bad credit get lower student loan interest rates. Just be aware that you won’t get as low of a rate as you would with good or excellent credit. So, while you may qualify for a rate reduction, it won’t be the best possible rate until you improve your credit. If you refinance with bad credit, then consider refinancing again once you improve your credit score. Take steps to build credit and avoid any actions that would damage your credit score. Then keep an eye out for refinancing offers in the mail to see if a bank or lender wants to offer you a better rate. Can you refinance student loans without a degree? You can absolutely refinance student loans with no degree. Although some lenders require you to provide proof of a degree, many do not. Simply check with lenders that offer you quotes to make sure they are willing to work with you. In order to refinance, your loans must be in repayment. Repayment periods start within 6-9 months of when you dropped out or dropped below half-time enrollment. If you plan to go back to school before the clock starts, then you can stop the repayment countdown and don’t need to worry about refinancing yet. But if you don’t, then repayment is imminent. The problem with repaying student loans with no degree is that you may not have the income you need. You took out loans to get a better career. Without that better career, you may find yourself stuck because you don’t have enough income to repay your debt efficiently. This happens to a lot of borrowers. In fact, people who have student loans but didn’t graduate are the most likely to face problems with student debt. But when it comes to refinancing, most lenders don’t care if you graduated or not. They just want to make sure you can afford the payments. If you can, they don’t care what job you have. You can refinance just like anyone else. Can you use a personal debt consolidation loan to refinance student loan debt? In most cases, no. Student loans don’t operate like other types of debt. Federal loan approval is based on need instead of creditworthiness. Federal loan interest rates are not set based on credit score. Lending standards – even on private loans – are more relaxed, so it’s easier to qualify for loans are lower rates even with bad credit. Student debt (even from private loans) is not as easily discharged through bankruptcy as other types of debt. For all these reasons, most lenders won’t let you refinance and consolidate student loans with other types of debt, such as credit cards. So, while a personal debt consolidation loan can be used for credit card debt, auto loan debt and even tax debt, student loans usually must be kept separate. Because it’s a special type of debt, student loans almost always require their own specialized debt solution. Can you use a home equity loan to refinance student loan debt? Yes, but you should do so only after extremely careful consideration. Most experts advise against using home equity to pay off other types of debt, including student loans. The reason is that you increase your risk of foreclosure. Defaulting on a student loan can ruin your credit and lead to things like wage garnishment. But a student loan service can’t take your home. If you default on a home equity loan or Home Equity Line of Credit (HELOC), then the lender can foreclose on you. There is, however, another program for using home equity that Fannie Mae launched in 2017. It’s called the Student Loan Cash-Out Refinance. Unlike a home equity loan or HELOC that takes out another mortgage against the homeowner’s primary residence (usually called a second mortgage), a cash-out refinance is a new mortgage. If you have equity built up in your home, you take out a new mortgage for an amount that’s higher than your existing mortgage. You receive the difference in cash. With a Student Loan Cash-Out Refinance, you use the funds you receive from the cash out to pay off student loan debt. You still only have one mortgage, so it doesn’t add as much additional risk of foreclosure. If you decide to use this option, though, make sure you will qualify for a lower interest rate. Depending on your credit score, mortgage rates may be higher the student loan interest rates for you. If the rate is higher, then you’re paying more instead of saving money. How do I decide when to refinance student loans? Refinancing debt is all about timing. You want to apply when Federal Reserve rates are low and your credit score is high. That combination gets you the lowest rate possible on your refi. If you’re thinking of refinancing, we recommend doing it sooner, rather than later. In 2017, the Federal Reserve started to raise the prime interest rate. When the Fed raises their rates, so do lenders. Rates were near zero following the Great Recession, which made refinancing very beneficial. Now that rates are rising, refinance rates are higher, making it less cost-effective to refinance student loans. So, if you have decent credit, don’t wait! The Federal Reserve has hinted heavily that they will continue to raise rates throughout 2018. Experts predict it will happen more than once. Rates usually increase by 0.25%. So, the longer you wait, the higher rates will get. Of course, you also want to consider refinancing if you significantly improve your credit. If your credit is fair now, take 6 months to build credit. Then look ask for student loan refi quotes to see what you can get. If the quotes look good, it’s the right time to refinance. 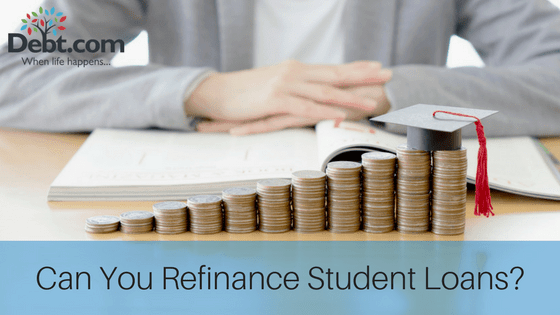 How do you find the best student loan refinance companies? Low fees and flexible terms are key. You want to look for a company that offers the best rate at the time when you’re looking for loan offers. However, fees can quickly increase your cost. Avoid companies that charge a loan origination fee, since many reputable student loan servicers don’t charge them. Also look for no prepayment penalties or early repayment fees. These mean that you pay a penalty fee if you if you try to pay off your loan faster with extra payments or larger payments. You must stick to the term of the loan exactly, which means more years in debt. If you can pay off your loans early, you should. So, you want the flexibility to do so. You should also check reviews, Better Business Bureau ratings, and consumer reports. Some student lenders are well-reviewed and known for great customer service. Others are not. The good news is that private lenders are more likely to offer good customer service. Federal loan servicers like Navient are notorious for customer complaints. How many times can you refinance student loans? There is no set limit to how many times you can refinance. Even if you use federal repayment plans, you can switch them as often as you need to. As your situation changes, you can switch between plans. Of course, when it comes to refinancing through a private lender, you need to be careful with your credit score. Each application for refinancing will create a hard credit inquiry on your credit report. Too many hard inquiries within 6 months will hurt your credit score. So, at the very least, you should spread refinancing out. Otherwise, you’ll hurt your score and won’t qualify for as good of a rate. Finally, realize lenders may be wary of you if you continuously refinance your debt. This is especially true if your financial situation is worse than the last time you refinanced. If you’ve taken on more student loan debt or have a higher debt-to-income because of credit card debt or other types of borrowing, then you at a higher risk of default. If a lender thinks your financial situation is getting worse, they will be more likely to reject your loan application. What does it mean to have an adjustable rate when you refinance? Adjustable rate loans can be extremely tricky to manage. When you have a fixed rate loan, the rate you get when you apply is the rate you pay through the life of the loan. That also means the payments stay the same over the life of the loan, too. You know what to expect, so your debt is fairly easy to manage. By contrast, adjustable rate loans (also called variable rate loans) have interest rates that change periodically. The timeframe for the adjustments depends on which rate index the lender uses. For example, most major student loan refinancing companies use the 1-month LIBOR (London Interbank Offered Rate) index. As the name suggests, 1-month LIBOR rates change every month. So, the interest rate on the refinanced debt can change every month, too. This is true whether you get your variable rate loan through Credible, SoFi, Citizens Bank or Laurel Road. Smaller lenders are likely to use the same index, too. To confirm, just ask any lender you get a quote from how their variable interest rates are calculated and how often they change. That also means that your monthly payment requirement may change, too. That’s a lot of uncertainty for your budget! Your rates can basically change all the time without notice. Unlike credit card issuers, adjustable rate lenders are required to inform you if your rate changes. Unless you have a lot of flexibility in your budget, be careful adjustable rate loans! They offer lower rates than fixed rate loans at the same credit score. However, the volatility can be too much for many borrowers to handle. Adjustable rate loans are easier to miss payments on and slip into default. So, don’t use this option unless you have the means to cover those constant fluctuations! Also, keep in mind that interest rates are currently on the rise. The Federal Reserve is gradually raising their prime rate. That means the interest rates on any adjustable rate loans are going up, too. If you get an adjustable rate loan, expect that the rate on your loan will gradually increase over the next year.